The way mothers and fathers spend their time has changed dramatically in the past half century. 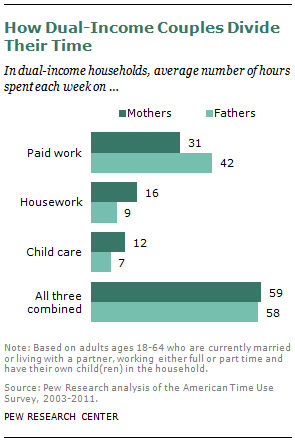 Dads are doing more housework and child care; moms more paid work outside the home. Neither has overtaken the other in their “traditional” realms, but their roles are converging, according to a new Pew Research Center analysis of long-term data on time use. 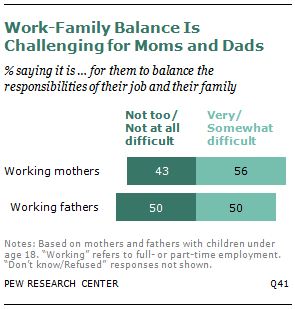 At the same time, roughly equal shares of working mothers and fathers report in a new Pew Research Center survey feeling stressed about juggling work and family life: 56% of working moms and 50% of working dads say they find it very or somewhat difficult to balance these responsibilities. However, mothers’ attitudes toward work have changed considerably in recent years. Among mothers with children under age 18, the share saying they would prefer to work full time has increased from 20% in 2007 to 32% in 2012. Tough economic times may have ushered in a new mindset, as women in the most difficult financial circumstances are among the most likely to say working full time is the ideal situation for them. At the same time, the public remains conflicted about what is best for children. Among all adults, only 16% say the ideal situation for a young child is to have a mother who works full time. A plurality of adults (42%) say mothers working part time is ideal, and one-third say it’s best for young children if their mothers do not work at all outside of the home. The Pew Research survey finds that about half (53%) of all working parents with children under age 18 say it is difficult for them to balance the responsibilities of their job with the responsibilities of their family. There is no significant gap in attitudes between mothers and fathers: 56% of mothers and 50% of fathers say juggling work and family life is difficult for them. Feeling rushed is also a part of everyday life for today’s mothers and fathers. Among those with children under age 18, 40% of working mothers and 34% of working fathers say they always feel rushed. With so many demands on their time, many parents wonder whether they are spending the right amount of time with their children. Overall, 33% of parents with children under age 18 say they are not spending enough time with their children. Fathers are much more likely than mothers to feel this way. Some 46% of fathers say they are not spending enough time with their children, compared with 23% of mothers. Analysis of time use data shows that fathers devote significantly less time than mothers to child care (an average of seven hours per week for fathers, compared with 14 hours per week for mothers). Among mothers, 68% say they spend the right amount of time with their children. Only half of fathers say the same. 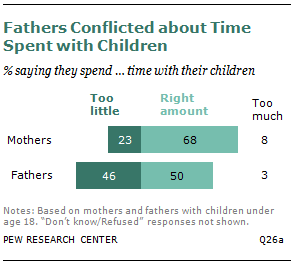 Relatively few mothers (8%) or fathers (3%) say they spend too much time with their children. A lot has changed for women and men in the 50 years since Betty Friedan wrote “The Feminine Mystique.” Women have made major strides in education and employment, and the American workplace has been transformed. But with these changes have come the added pressures of balancing work and family life, for mothers and fathers alike. Trends in time use going back to 1965 clearly show how the increased participation of women in the workforce has affected the amount of time mothers devote to paid work. 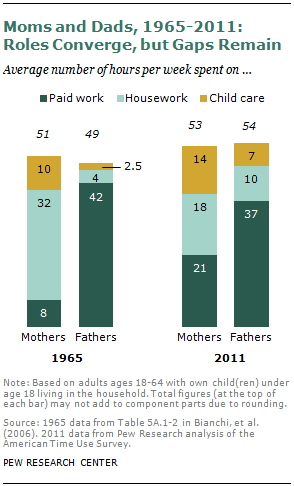 In 2011, mothers spent, on average, 21 hours per week on paid work, up from eight hours in 1965. Over the same period, the total amount of time mothers spend in non-paid work has gone down somewhat. For their part, fathers now spend more time engaged in housework and child care than they did half a century ago. And the amount of time they devote to paid work has decreased slightly over that period. Fathers have by no means caught up to mothers in terms of time spent caring for children and doing household chores, but there has been some gender convergence in the way they divide their time between work and home. Roughly 60% of two-parent households with children under age 18 have two working parents. In those households, on average, fathers spend more time than mothers in paid work, while mothers spend more time on child care and household chores. However, when their paid work is combined with the work they do at home, fathers and mothers are carrying an almost equal workload. How Do Today’s Mothers and Fathers Rate Themselves? In spite of challenges they face, today’s parents give themselves good grades overall for the job they are doing raising their children. Among all parents with children under age 18, 24% say they have done an excellent job, and an additional 45% say they have done a very good job. Some 24% say they have done a good job, and only 6% rate their job as parents as fair or poor. Mothers give themselves somewhat higher ratings than do fathers: 73% of mothers say they are doing an excellent or very good job as a parent, compared with 64% of fathers. Working mothers give themselves slightly higher ratings than non-working mothers for the job they are doing as parents. Among mothers with children under age 18 who work full or part time, 78% say they are doing an excellent or very good job as parents. Among mothers who are not employed, 66% say the same. The new Pew Research survey finds a strong correlation between financial well-being and views about the ideal work situation. Among women who say they “don’t even have enough to meet basic expenses,” about half (47%) say the ideal situation for them is to work full time. By contrast, only 31% of women who say they “live comfortably” say working full time is their ideal situation. Marital status is also strongly linked to views about the ideal work situation, and the gap in views between married and unmarried mothers has widened significantly in recent years. Among unmarried mothers, about half (49%) say working full time would be their ideal. This is up dramatically from 26% who said the same in 2007. Only 23% of married mothers today say their ideal situation would be to work full time, basically unchanged from 2007. A plurality of mothers (45%) and about four-in-ten fathers (41%) say the best thing for a young child is to have a mother who works part time. Relatively few (16%) say having a mother who works full time is best for children. Mothers’ views about this have remained relatively consistent over the past few years, while fathers’ attitudes have changed significantly. In 2009, 54% of fathers with children under age 17 said the ideal situation for young children was to have a mother who did not work at all outside the home; today only 37% of fathers say that—a drop of 17 percentage points. When asked how difficult it is for them to balance the responsibilities of work and family life, 16% of working mothers and 15% of working fathers say it is very difficult. Overall, 56% of working mothers and 50% of working fathers say it’s either very or somewhat difficult for them to balance work and family. Whether parents feel they spend enough time with their children has a big impact on how they evaluate their parenting. Parents who think they spend the right amount of time with their children are about three times as likely as parents who say they spend too little time with their children to say they are doing an excellent job parenting (30% vs. 11%). Among mothers with children under age 18, married moms are happier overall than unmarried moms. Fully 43% of married mothers say they are very happy with their life these days; only 23% of unmarried mothers say the same. There is also a significant gap in happiness between working and non-working mothers: 45% of non-working mothers say they are very happy, compared with 31% of mothers who work either full or part time. When other factors (race, ethnicity, income and education) are taken into account, marriage is a significant predictor of a mother’s happiness while employment status is not. The amount of time parents spend with their children continues to go up. Fathers have nearly tripled their time with children since 1965. Mothers’ time with children has also increased, and today’s mothers spend more time with their children than mothers did in the 1960s. There is still a large gender gap in time spent with children: Mothers spend about twice as much time with their children as fathers do (13.5 hours per week for mothers in 2011, compared with 7.3 hours for fathers). The amount of time parents spent doing housework has changed significantly too. Fathers’ time spent doing household chores has more than doubled since 1965 (from an average of about four hours per week to about 10 hours). Mothers’ time doing housework has gone down significantly over the same period (from 32 hours per week to 18). Married parents spend more time at work than unmarried parents, counting housework, child care and paid work together, and have less leisure time than other parents. Married parents are also more egalitarian than cohabiting couples. Married fathers’ time in paid and unpaid work totals about 55.5 hours per week, 1.4 hours more than that of married mothers. Yet the total work hours for cohabiting fathers are almost three hours less than that of cohabiting mothers. When paid work, child care and housework are combined, parents in dual-income households have a more equal division of labor than parents in single-earner households. In dual-income households, fathers put in, on average, 58 hours of total work time a week, compared with 59 hours for mothers. In households where the father is the sole breadwinner, his total workload exceeds that of his spouse or partner by roughly 11 hours (57 vs. 46 hours per week). In households where the mother is the sole breadwinner, her total workload exceeds that of her spouse or partner by about 25 hours (58 vs. 33 hours per week). Men spend more time than women in leisure activities (such as watching TV, playing games, socializing and exercising). The gender gap in leisure time is bigger among men and women who do not have children in the house (37 hours per week for men vs. 32 hours per week for women). Among parents with children under age 18, fathers spend, on average, 28 hours per week on leisure activities, while mothers spend 25 hours on leisure. The report is divided into two main sections. Section I, Public Opinion Survey Findings (Chapters 1-3), is based mainly on the new Pew Research survey. Chapter 1 looks at women’s growing presence in the labor market and explores changing attitudes about work. Chapter 2 looks at the challenges mothers and fathers face in attempting to balance work and family life. Chapter 3 explores how these challenges are affecting parents—both in terms of their overall happiness and in how they evaluate the job they are doing raising their children. Section II of the report, Time Use Findings (Chapters 4-6), primarily draws from time use surveys and includes public opinion questions related to time use when available. Chapter 4 provides an overview of how mothers and fathers spend their time in the workplace and at home and how they feel about their time. Chapter 5 goes into detail about the long-term trend in time use among men and women—and fathers and mothers—over the past five decades. Chapter 6 looks at current time use patterns among parents of different family types and living arrangements. Paul Taylor, executive vice president of the Pew Research Center and director of Social & Demographic Trends, provided the editorial guidance and also edited the report. Eileen Patten, Research Assistant, assisted in drafting several chapters of the report and also helped with charts, formatting and number checking. Ana Gonzalez-Barrera, Research Associate with Pew Research’s Hispanic Center, assisted with number checking. Marcia Kramer of Kramer Editing Services copy-edited the report. 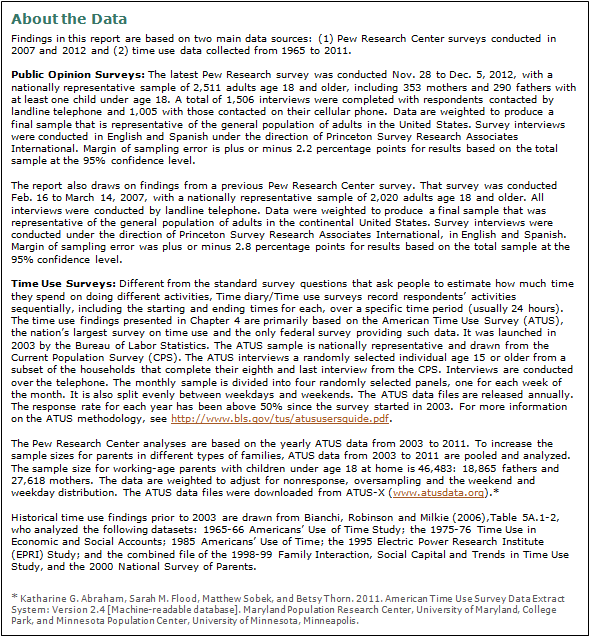 The Pew Research Center thanks Margaret Usdansky of Syracuse University for her contribution in the initial planning of the project and her exploration of the American Time Use Survey data and Suzanne Bianchi of University of California, Los Angeles for her insights in historical time use surveys and her expertise in time use research. Gretchen Livingston and Rick Fry, both senior researchers at Pew Research’s Hispanic Center, contributed economic and demographic research for the report. Cary Funk, Senior Researcher at Pew Research’s Forum on Religion and Public Life, helped with data analysis. Quiz: Which Parent Does More in Your Home?